I was recently a guest speaker at the European Obesity Summit 2016 in Gothenburg, Sweden. This is one of the major scientific society events held worldwide and brought together many outstanding leaders from Europe. At the summit, Herbalife sponsored a session focused on the Global Nutrition Philosophy of Herbalife. Chief Health and Nutrition Officer Dr. John Agwunobi and I presented on health and nutrition topics. Dr. Agwunobi addressed the important issue of workplace wellness programs. I addressed how balanced nutrition, healthy, active lifestyle, and personalization can support wellness through healthy aging at any age, and here is a recap of some of my presentation. What is aging? It’s the accumulation of changes in an organism with the passage of time. Aging refers to a multidimensional process of physical, psychological and social changes. Some capabilities grow and expand with aging, while others decline. Reaction time, for example, may slow with age, while knowledge of world events and wisdom may expand. The world’s population is aging and along with global aging comes special health challenges. According to the 2015 United Nations World Population Ageing Report, by 2050, one in five people will be aged 60 or over. We know that genes, nutrition and exercise contribute to longevity, but what are the characteristics of long-living people? We all know people who look young for their age and others who look much older than their age in years. A 96-year-old dentist in the U.K. holds the track records for the 100- and 200-meter races for his age. He starts each day with a protein shake and exercises regularly. He only started lifting weights at age 80. His major complaint is that there are no women over 70 on Internet dating sites. Experts have also observed that people who live in so-called Blue Zones, demographics or areas where people live measurably longer lives, share some common characteristics. People in Blue Zones such as Sardinia, Okinawa, Nicoya Peninsula in Costa Rica and Loma Linda, California are generally physically active, share strong social ties, and consume a healthy diet (fruits, vegetables, legumes). They also tend not to smoke. Aging is a process that starts early, so forming good habits, and passing them along to younger people, is a great place to start. Avoid the negative combination of overeating and sedentary lifestyle. Remember that obesity is not always obvious. Some people don’t appear to be fat, but they may be building up unhealthy fat inside the abdomen over time. Studies done by Dr. Jimmy Bell in London found that 60% of men and 45% of women have too much abdominal fat even at normal body weights. Abdominal fat when it accumulates promotes inflammation throughout the body. As we age, we lose muscle unless we make an effort to exercise including resistance exercise. Our muscles actually lose mass, strength, and the nerves connecting to muscles, over time. Incorporating strength training into your fitness routine is important to supporting muscle growth. Muscle cells also burn more calories (30 kcal/kg) as they help us move and maintain posture by comparison to fat cells (6 kcal/kg), which primarily store calories. Many people notice weight gain in middle age even when they don’t increase their calorie intake, as they lose muscle with a drop in the number of calories being burned each day. Protein is key to supporting your muscles when combined with a healthy, active lifestyle. If you happen to be an endurance athlete, you need more protein than the average person. So individuals with more protein in their body need more protein in their diets. One challenge is that many people are getting an unbalanced protein distribution throughout the day. They get too little at breakfast, a little more at lunch, and so much protein at dinner that some of it cannot be used by the body. When averaged throughout the day, the amount of protein being eaten is too low. 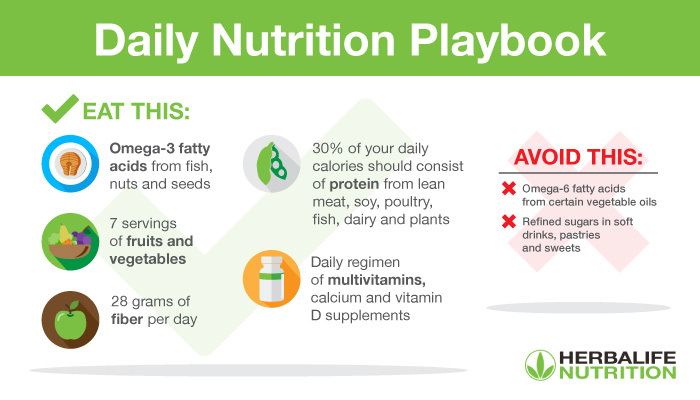 For the right balance of macronutrients and micronutrients, the Herbalife Global Nutrition Philosophy is a great reference point. It calls for 40% carbs, 30% protein and 30% healthy fats throughout the day. Balance your energy intake (eating) and expenditure (activity/exercise) to avoid accumulating abdominal fat. You can do this by consuming protein-rich meal replacement shakes, in conjunction with eating healthy meals and snacks, which will help manage your caloric intake, and by also getting plenty of exercise. Balance fats by reducing intake of omega-6 fatty acids from certain vegetable oils and increase beneficial omega-3 fatty acids from ocean-caught fish, nuts and seeds. Limit refined added sugars in soft drinks, cakes, pastries, cookies, and candy. Instead, when you want to eat carbohydrates, choose good fructose, the natural sugar found in fruits. Increase antioxidants and phytonutrients by getting seven servings of colorful fruits and vegetables every day. Consume at least 28 grams of soluble and insoluble fiber every day for digestive health. Based on your personal needs, develop a daily regimen of multivitamins, calcium and vitamin D supplements to augment your dietary intake. There is no fountain of youth, but there are good habits that can help you age well. Genetics certainly plays an important role in healthy aging, but it turns out that we have the potential to support our nutrition and wellbeing through the lifestyle choices we make every day. It is not possible to reverse aging, but healthy, active lifestyle can help you age in a healthier way. It’s never too early or too late to get started on a path to healthy aging, so start today.